New findings by a McGill researcher may mean that a hard-fought 20-year battle with onchocerciasis, commonly known as river blindness, is about to get even tougher. The study was led by Roger Prichard, James McGill Professor at the University’s Institute of Parasitology, and shows a disturbing population boom among the parasitic worms that cause the disease in certain West African communities, in spite of traditional treatments. Ivermectin is the only widely available drug used to treat river blindness; an ivermectin-resistant parasite could spell disaster for people living in affected areas. The study, published in Lancet, followed 2,501 infected people in 20 communities around Ghana. Two McGill graduate students, Mike Y. Osei-Atweneboana and Jeff K. L. Eng, conducted the bulk of the research in partnership with local health authorities. “This finding has important implications for this disease re-emerging and becoming a serious scourge,” Prichard says. He warns that, if left unchecked, resistant parasites could wreak havoc in areas where widespread treatment had previously brought river blindness under control. The disease is caused by blackflies commonly found in highly oxygenated, swift-moving water. In addition to irreversible blindness, it also causes itching so severe that excessive scratching often results in depigmentation and blotchy, leopard-like patterns on the skin. The World Health Organization estimates that 99 per cent of the world’s 18 million infected people are in Africa, with the remainder in Latin America and Yemen. Even when effective, ivermectin merely halts the progress of the disease without killing the adult parasites, and there is no vaccine. 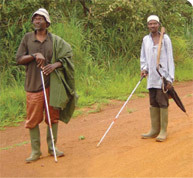 After trachoma, river blindness is the world’s second leading infectious cause of blindness. This research is funded by the UNICEF-UNDP-World Bank-World Health Organization Special Programme for Research and Training in Tropical Diseases, the Onchocerciasis Control Program, the African Program for Onchocerciasis Control, the Government of Ghana, the Canadian Institutes of Health Research and the Fonds québécois de la recherche sur la nature et les technologies.